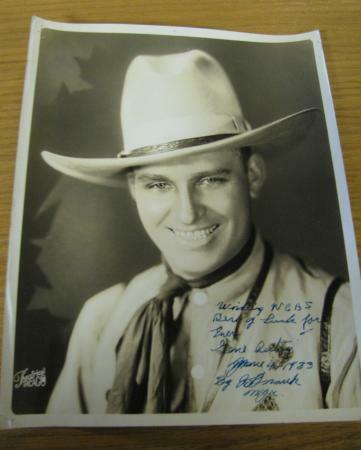 An autographed photograph of entertainer Gene Autry was part of a recent donation to WIU Archives by a local radio station that recently ended its broadcasts after 95 years. MACOMB, IL -- From first to last broadcast, spanning 1922-2017, WCAZ Radio, Carthage (AM 990), has made an initial donation of its archived materials to the Western Illinois University Archives and Special Collections. The broadcast range of the station covered most of the collecting region of WIU's Archives. Established by "tinkerer" Robert Compton of Augusta, IL (Hancock County), WCAZ was the second licensed station in Illinois. Early broadcasts focused on local talent and Carthage College. After Compton's death, his wife turned the station over to her daughter and son-in-law, Betty and Jerry Nutt. They sold the station in 1978, when Pioneer Broadcasting took over. Recent programs focused on local high school sports and agriculture. The new collection contains photographs, scrapbooks of newspaper clippings and correspondence and promotional materials used by the station throughout its history, including an autographed photo of singer/songwriter Gene Autry. Other photographs depict equipment, staff, station offices and local performers, such as Billy Baird's Dance Orchestra of Browning, IL and harpist Mary Bley of Keokuk, IA. Former station employee and current head of Libraries Circulation Greg Phelps took the initiative to have the collection donated. Phelps worked for WCAZ for 23 years and was an on-air talent. He also broadcast sports and did weekend air shifts. "The collection came from a previous owner (Jerry Nutt) and was given to (current owner) Rob Dunham to have for posterity," said Phelps. "Since WCAZ has been shut down, I spoke with Rob about preserving the heritage of WCAZ, which had been on the air for more than 95 years. We decided it would be a great idea to donate the collection to Archives and share that heritage with our area." WIU Dean of Libraries Michael Lorenzen said he is pleased the station remembered the Archives. "The materials will make an excellent addition to the regional collection for future researchers," Lorenzen added. There are plans to have additional material donated in the future. For more information about WIU Libraries, visit wiu.edu/libraries.